Nancy leathem's Trees and Branches: Mrs. Medhurst nee Shaw, The Oldest Sydney Native, 1800-1891. 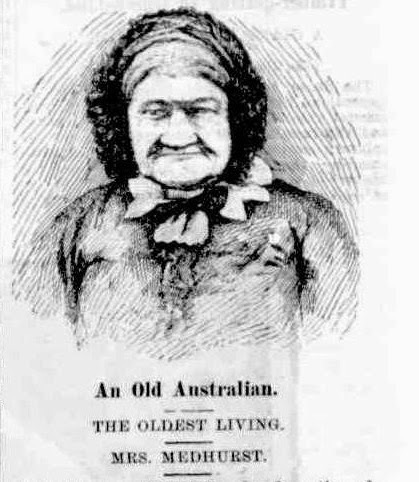 Mrs. Medhurst nee Shaw, The Oldest Sydney Native, 1800-1891. 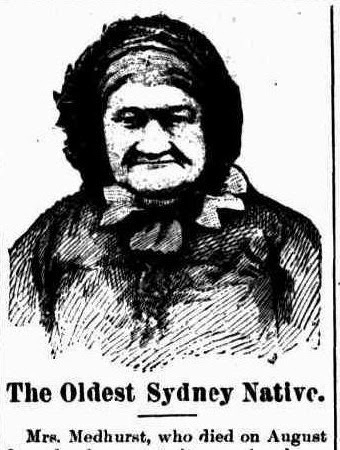 Probably the oldest living female native of Sydney is Mrs. Catherine Medhurst, who resides with her eldest daughter, Mrs. Pateman, at Narara, near Gosford. Mrs. Medhurst was born on Christmas Day, 1800, 12 years after the imperial ensign first waved over the founders of the colony on the shores of Port-Jackson. Many events which materially affected this country occurred in every one of its earliest years, and the year in which Mrs. Medhurst was born saw many occurrences that helped to shape our history. An import duty was first established in1800. The articles selected were spirits, beer, and wine, and the impost was to raise a fund for completing Sydney Gaol. A great number of political prisoners who had taken part in the Irish rebellion of 1798 and a scare created by the false statements of a convict of a plot by his companions to revolt were events which happened early in the year. These circumstances led to the formation of two volunteer corps of 50 men each, under the designation of the Sydney and Parramatta Loyal Associated Corps. Mrs. Medhurst's parents came to Sydney in the ship Cornwallis, one of the first vessels to arrive after the "first fleet." Herfather was an Englishman and her mother an Irishwoman. The maiden name of Mrs. Medhurst was Catherine Shaw. The old lady was born in Back Row, a street of some importance in those early days and situated in the "Rocks" region. At 16 years of age Mrs. Medhurst left Sydney for Windsor, and was married there a year later, at the Church of England, by the Rev. Mr. Fulford. After their marriage the couple left for the Wollombi district. She has resided at Gosford for about 45 years, and in addition to bringing a large family into the world on her own account, she for 30 years practised as a mid-wife, and her eldest daughter is following the same occupation. The old lady has been, as long as she can remember, a total abstainer, and is a member of the Wesleyan Church, but was until some years ago an attendant at the Church of England. A special reporter from this journal interviewed the old lady and found her memory wonderful. She is quite hearty, and her eyesight is so good that she occupies her time chiefly in reading religious books. Her hearing is so remarkable that her interviewer had no difficulty in carrying on a conversation with her, and, with very little effort on her part, Mrs. Medhurst supplied most of the particulars here given. On the occasion of the interview the venerable old lady walked from her bedroom to the sitting-room almost un-assisted, and took her seat in a high-backed chair. She was quite daintily and picturesquely dressed in a pink and white sprigged frock, white apron edged with pretty lace, and a spotless snow-white cap with lace frills-an eloquent testimony to the care and affection of her daughter and son-in-law. Mrs. Medhurst spoke highly of their kindness and dutiful care of her. Mr. and Mrs. Pateman are hardworking people much respected in the neighbourhood, and Mrs. Pateman, though 66 years of age, is as hale and hearty as a woman of 45. Mrs. Medhurst leant upon a silver-topped walking stick, and, as she talked, gave it many little shakes and twirls, which seemed to aid her memory. To the interviewer her face was a surprise, for her great age the features were not shrivelled or shrunken; they were almost plump, and the brightest of brown eyes looked about her sharply and intelligently. Mrs. Medhurst's husband, who was engaged in farming pursuits, died a few years ago, and the photograph from which our portrait was obtained was taken at Gosford some little time before his death. Mrs. Medhurst has had 11 children, 8 of whom are still living, and these have all had large families. Mrs. Pateman, the eldest daughter, has had 12 children, another daughter was the mother of 15, three others are credited with 9 each, one with 11, and one with 7. Summed up, the old lady has the honor of having contributed to the population of this country a great many descendants, classified as follows: 8 children, 71 grandchildren, 70 great-grandchildren, and 18 great-great-grandchildren. Mrs. Medhurst, who died on August 8, and whose portrait we give herewith, is supposed to have been the oldest Sydney native. She was born in Sydney on Christmas Day, 1800, twelve years after the landing of Captain Phillip. She was therefore 94 years of age, one year younger than Mrs. Kiernan, whose portrait also appears in this issue. Mrs. Medhurst was married in Sydney, and has resided in the Gosford district for about 6O years. Her father was an Englishman, and her mother an Irishwoman. She has had 11 children, eight of whom were living when her portrait formerly appeared in this paper in 1801, and had large families. Mrs. Pateman, the eldest daughter, then had 12 children, another daughter was the mother of 15 three had nine each, one with 11 and one with seven. Summed up the old lady's descendants were eight children, 71 grandchildren, 70 great-grandchildren, and over 20 great-great-grandchildren. It may interest teetotallers to know that Mrs. Medhurst was a total abstainer.